This page has research, submissions and articles organised by subject matter. Click on the link for similarly organised media releases, news articles and photos. The article satirically proposes an application for an Exploration Permit for Food (EPF) in the area currently undergoing exploration for bauxite. Letter to DEEDI about un-authorised drilling on farm land. Company presentation outlines the case for exploration for bauxite near Kingaroy. 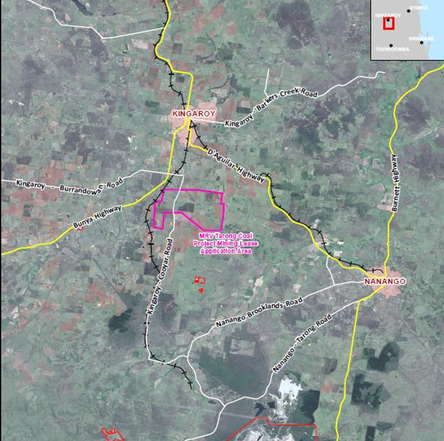 Map shows extent of QBL's permit to explore for bauxite near Coolabunia. South Burnett Times article regarding plans to explore for bauxite near Kingaroy. A scientific analysis of the likely impact of the mine on Kingaroy, with reference to coal dust and arsenic. A summary of concerns about the proposed Kingaroy coal mine, including comments from almost 100 local residents. KCCG's response to the documents lodged by MRV for the mine project to be of Commonwealth Govt interest. A scientific study on the effects of coal mining on public health. MRV's plan for the mine in the form of a pre-feasibility study. 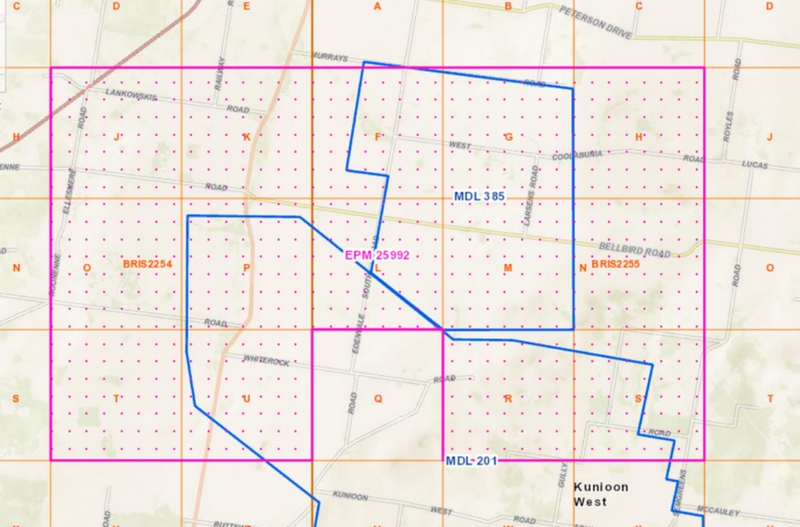 This map shows the Mining Development Lease 385, previously Cougar Energy's UCG area now for Moreton Resources proposed coal mine. Copy of letter to landholders asking to negotiate land acquisition for Kingaroy Mine. The likely impact on Kingaroy of dust from the coal mine. The likely impact of the mine on Kingaroy property prices. An example of a Terms of Reference (TOR) document for a coal mine. Government information about State Co-ordinated Projects. Map showing MDL 385 and EPC 882 (without property lines). Simplified diagram of the likely mining approval process. Detailed map showing proposed mine site. Details of the proposed mine in the form of an IAS. 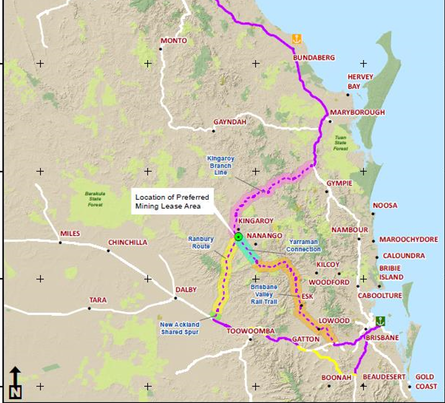 ​Moreton Resources limited mine to port rail network options. Moreton Resources Limited Kingaroy rail options. KCCG material about Land Access Code reform and shortcomings in the Strategic Cropping Land criteria. A letter to State Govt about unauthorised drilling. Letter to Govt. inviting changes to the Land Access Code. Reply from Govt about KCCG initiated changes to Land Access Code. Letter to Govt regarding details of meeting about short comings in the LAC process. Letter to Govt regarding details of meeting about short comings to the SCL criteria. The green dotted ares of the map on the right are those areas categorised as strategic cropping land. KCCG submitted material to the Senate Inquiry into Unconventional Gas Mining in Australia. KCCG was the subject of a paper by a university student studying community action groups. Research concerning UCG that first alerted KCCG to potential problems with the Cougar Energy trial. Ministerial briefing notes (RTI approved) regarding the trial of UCG in Qld. Final report by three man Expert Panel into UCG in Qld. KCCG letter to local residents summarising the proposed Cougar Energy Power Station and UCG trial. Request to Minister about details of the UCG failure. State Govt commissioned the expert panel to write a report on each of the three UCG trials in Qld. KCCG made detailed and scientific response to material that Cougar Energy submitted to Govt. KCCG referred member concerns about Cougar Energy share trading activity to ASX and ASSIC. Cougar Energy's failed UCG trial was the subject of a State Ombudsman's report into the administration of the trial. ASX responded to KCCG's inquiry about Cougar Energy share trading activity. Detailed response from Govt to KCCG about 5 key questions associated with Cougar Energy. KCCG submitted detailed evaluations of Cougar Energy's reports to Govt after the technical failure of the plant. Court appeal by Cougar Energy is dismissed.